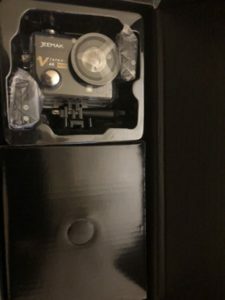 I ordered the Jeemak 4k Action Camera (Jeemak 74-r) because I was interested in a Go Pro like camera. These are my first thoughts after receiving the camera and a few test shots. The video contained within this article was shot on the camera. 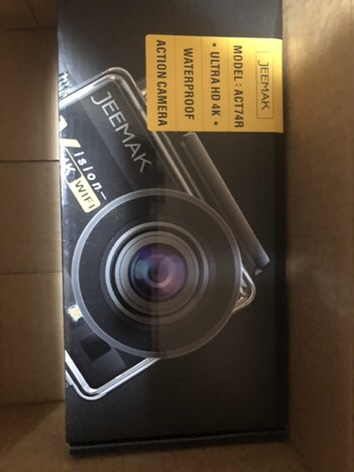 I ordered my Jeemak 4k Action Camera from Amazon, shortly after I placed my order, I received an email staying that the camera would arrive about a week later. To my surprise, I actually got my camera 2 days after I ordered it. Once I got the camera and opened the package, I realized that I did not have an SD card. For the most part, I had to wait until I could get one to see what this camera could do. The documentation that comes in the package is vague. There are no real instructions on how to put the mounts together. The instructions say that the camera only accepts class 10 or higher sd cards. It seems as if the instructions are translated from another language into English. After a few shots, I decided to hook the camera up to my computer a view what I had shot. The onboard screen is tiny and view always looks grainy. If you want to download the pictures and videos you will have to put the camera in USB Mode. When I first tried to put the camera in USB Mode it gave an error, after that it was fine and the drive popped up on my desktop. Perhaps I do not have the SD card inserted correctly but it is more than likely a problem with the card itself or the camera. I used a PNY 32 GB micro SDHC card. In my opinion, the video is excellent with light and horrible in the dark. The first video at the top of the page is shot in 1080p (1920 x 1080) at 30 fps (frames per second). The second video in the middle of the page is shot in 720p at 60fps. The camera has options for 720p at 30fps, 1080p at 60 fps, 2.7k at 30fps and 4k at 30 fps. The camera can also be used as a webcam. I would suggest picking up a card reader, especially if you are going to be recording longer videos. It is also worth noting that the lens has a 170-degree viewing angle which is great for capturing sweeping landscapes. The camera has an HD output port but does not come with the cable. If you do not have a computer or device to transfer the videos and pictures to, this would become an issue. There is a wifi app for your smartphone recommended in the instructions called Sports XDV. With Sports XDV you can view the recordings of the action cam live, take pictures, and set most of the settings. You can also view the recordings after you finish and transfer the videos to your smartphone. The Jeemak 4k Action Camera is far from perfect. Since this is my first action camera, I have nothing to compare this to. I can confirm that an action camera cannot replace a point and shoot camera or a DSLR camera any better than a smartphone camera can. Everything considered I would recommend this camera to anyone who is just starting out or just looking for a budget-friendly action camera. Thank you for bookmarking my site. You can also allow notifications to get notified of new content. I definitely savored every part of it and i also have you book marked to check out new information in your blog. Thank you, you can also allow notifications for push updates. up. The text in your article seem to be running offf the screen in Ie. Thanks for the heads up. So few people still use internet explorer that I never thought to check it. if you would like a better experience, use edge, chrome, firefox or opera as I test for compatibility using these browsers. On another note. I would love to check out the olde hickory taproom sometime and do a review.